British Beatles Fan Club: Review: Pepperland - Wow! 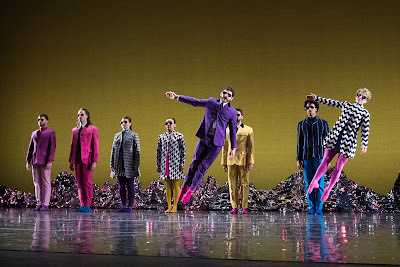 Sadler’s Wells, London March 22, 2019. Currently touring the UK, this excellent show is a celebration of the album Sgt. Pepper. The show was originally premiered in Liverpool in May 2017 as part of the Pepper at 50 celebrations. 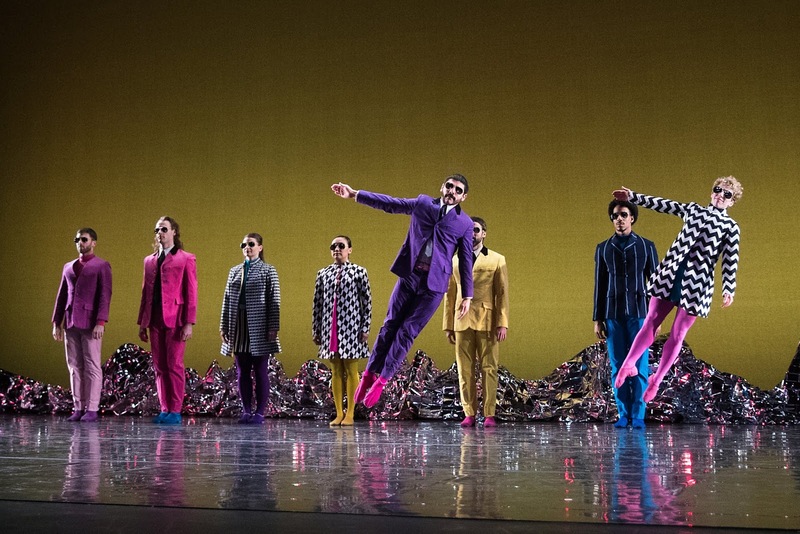 Performed by the Mark Morris Dance Group, the show contains six songs from the album plus ‘Penny Lane’ intertwined with a score by Ethan Iverson based on the album, the concept and the album sleeve. It’s an interesting take on the album with virtually all the cast being from the USA. The choreography throughout is superb. The dancers are in colourful outfits. The only thing I couldn’t work out was what the back drop of the set meant. The show opens with ‘Sgt. Pepper’ followed by ‘Magna Carta’, part of the score which introduces some of those who feature on the album cover. What was particularly great about this was that some of those lesser known people on the sleeve were mentioned. The cast also didn’t try to look like those who were introduced. Marilyn Monroe appeared as a brunette and we also had a black Albert Einstein. These things added to the joy of the show which I took to mean that it doesn’t matter what or who we are- we are all one, something The Beatles would have appreciated with their messages of peace and love. ‘A Little Help from My Friends’ and ‘When I’m Sixty-Four’, come before one of the best parts of the show. ‘Within You, Without You’ has one of the dance group sat close to the front of the stage in dark glasses, which reminded me of the ‘Blue Jay Way’ sequence from the Magical Mystery Tour film. He is motionless throughout whilst the rest of the group dance around the stage. It was very pleasing that this song was included in the show. After some more music from the score we have ‘Penny Lane’ and then ‘A Day in The Life’. ‘A Day in The Life’ was for me the best part of the show. 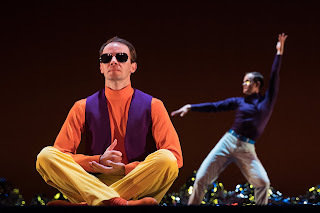 As the song was being played instrumentally, the dancers acted out the words with magical sequences. ‘I read the news today oh boy. The English army had just won the war’ was acted out with dancers crawling on the ground like soldiers, before standing up, saluting and giving the peace sign. This was just one example. I don’t want to give everything away. We close with the ‘Sgt. Pepper Reprise’. The songs are sung beautifully by Clinton Curtis. It would be wrong of me to single any of the dancers out for special praise as they were all superb. The show lasted just over an hour, and the cast received a standing ovation at the end. If you are in the UK, you don’t need to spend thousands of pounds going to see Love in Las Vegas. You will have just as much fun seeing this magical show. If you get the chance go and see this magical show and celebration of one of the greatest albums ever made. The show is touring the following locations between now and the end of April: Birmingham, Salford Quays, Bradford, Edinburgh, Canterbury, Cardiff, Plymouth, Southampton, Norwich, Newcastle and Dublin.